The increase of pathogens being resistant to antibiotics represents a global health problem and therefore it is a pressing need to develop antibiotics with novel mechanisms of action. Host defense peptides, which have direct antimicrobial activity (also termed antimicrobial peptides) or immune modulating activity, are valuable template structures for the development of such compounds. Antimicrobial peptides exhibit remarkably different structures as well as biological activity profiles with multiple targets. A large fraction of these peptides interfere physically with the cell membrane of bacteria (focus of this review), but can also translocate into the cytosol, where they interact with nucleic acids, ribosomes and proteins. Several potential interaction sites have to be considered on the route of the peptides from the environment to the cytoplasmic membrane. Translocation of peptides through the cell wall may not be impaired by the thick but relatively porous peptidoglycan layer. 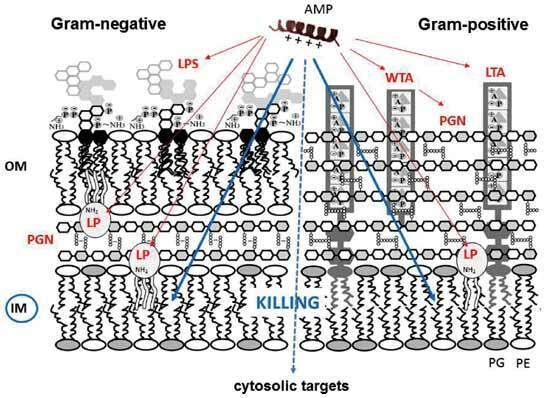 However, interaction with lipopolysaccharides of the outer membrane of Gram-negative bacteria and (lipo)teichoic acids of Gram-positive bacteria may reduce the effective concentration at the cytoplasmic membrane, where supposedly the killing event takes place. On a molecular level several mechanisms are discussed, which are important for the rational design of improved antimicrobial compounds: toroidal pore formation, carpet model (coverage of membrane surface by peptides), interfacial activity, void formation, clustering of lipids and effects of membrane curvature. In summary, many of these models just represent special cases that can be interrelated to each other and depend on both the nature of lipids and peptides. Keywords: Antimicrobial resistance, Cell envelope, Host defense peptides, Interfacial activity, Membrane permeabilization, Membrane composition, Membrane curvature, Pore formation. Affiliation:Institute of Molecular Biosciences, Biophysics Division, University of Graz, NAWI Graz, BioTech- Med Graz, Humboldtstrasse 50/III, 8010 Graz, Austria. Keywords:Antimicrobial resistance, Cell envelope, Host defense peptides, Interfacial activity, Membrane permeabilization, Membrane composition, Membrane curvature, Pore formation. Abstract:The increase of pathogens being resistant to antibiotics represents a global health problem and therefore it is a pressing need to develop antibiotics with novel mechanisms of action. Host defense peptides, which have direct antimicrobial activity (also termed antimicrobial peptides) or immune modulating activity, are valuable template structures for the development of such compounds. Antimicrobial peptides exhibit remarkably different structures as well as biological activity profiles with multiple targets. A large fraction of these peptides interfere physically with the cell membrane of bacteria (focus of this review), but can also translocate into the cytosol, where they interact with nucleic acids, ribosomes and proteins. Several potential interaction sites have to be considered on the route of the peptides from the environment to the cytoplasmic membrane. Translocation of peptides through the cell wall may not be impaired by the thick but relatively porous peptidoglycan layer. However, interaction with lipopolysaccharides of the outer membrane of Gram-negative bacteria and (lipo)teichoic acids of Gram-positive bacteria may reduce the effective concentration at the cytoplasmic membrane, where supposedly the killing event takes place. On a molecular level several mechanisms are discussed, which are important for the rational design of improved antimicrobial compounds: toroidal pore formation, carpet model (coverage of membrane surface by peptides), interfacial activity, void formation, clustering of lipids and effects of membrane curvature. In summary, many of these models just represent special cases that can be interrelated to each other and depend on both the nature of lipids and peptides.